R'-1)_2 and C3PO will not represent the United States in the Moscow Olympics. But the technology that produced those robot heroes of Star Wars may be outdone by some of the scientific applications that will be available to American amateur athletes even before 1980. That prospect was enhanced by the recent appointment of Dr. Gideon Arid as the USOC's Director of Research in Biomechanics and Computer Sciences. Arid brings to the USOC a method of biomechanical analysis that could revolutionize coaching and training in the technical aspects of track and field, and other sports as well. The key to Ariel's innovative system is the "digitizer," a device that allows him to take films of athletes in competition or training and break them down into component parts, frame by frame. With an electronic pen, he traces the position of key body points (wrists. elbows, shoulders, etc.) and transfers that data to a computer which produces stick drawings that show where each point is at each moment in time. Arid has also developed computer programs that apply biomechanical principles to the position and velocity information obtained from the digitizer. With his computer, Arid can determine precisely all of the biomechanical forces bearing upon an athlete's performance. lie can also compute the theoretical advantage that could result from a specific change in form. "If it seems that a hammer thrower's elbow is in the wrong position at a certain time." he explained, "1 can have the computer move it an inch or two and then recalculate the forces. That will tell me how much distance this particular thrower would have added if his elbow had been where I placed it. Once the computer is programmed, we can do all sorts of experiments in order to find the best results without wasting the time of the athlete or his coach." 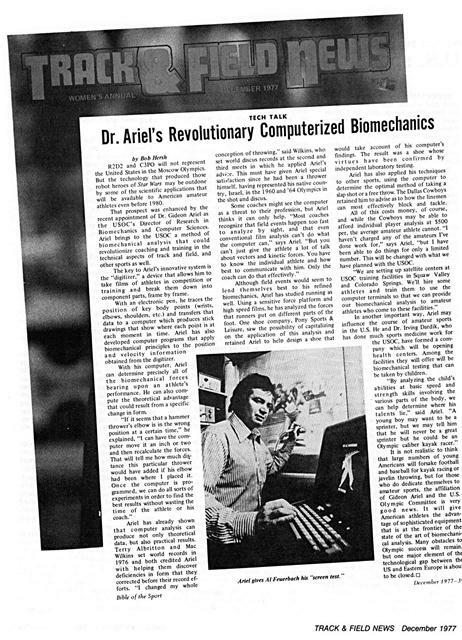 Ariel has already shown that computer analysis can produce not only theoretical data, but also practical results. Terry Albritton and Mac Wilkins set world records in 1976 and both credited Ariel with helping them discover deficiencies in form that they corrected before their record efforts. "I changed my whole conception of throwing." said Wilkins, who set world discus records at the second and third meets in which he applied Aric! 's advi:c. This must have given Ariel special satidaction since he had been a thrower himself, having represented his native country. Israel, in the 1960 and '64 Olympics in the shot and discus. Some coaches might see the computer as a threat to their profession, but Arid thinks it can only help. "Most coaches recognize that field events happen too fast to analyze by sight. and that even conventional film analysis can't do what the computer can." says Ariel. "But you can't just give the athlete a lot of talk about vectors and kinetic forces. You have to know the individual athlete and how best to communicate with him. Only the coach can do that effectively." Although field events would seem to lend themselves best to his refined biomechanics. Ariel has studied running as well. Using a sensitive force platform and high speed films, he has analyzed the forces that runners put on different parts of the foot. One shoe company. Pony Sports & leisure, saw the possibility of capitalizing on the application of this analysis and retained Ariel to help design a shoe that would take account of his computer's findings. The result was a shoe whose virtues have been confirmed by independent laboratory testing. Ariel has also applied his techniques to other sports. using the computer to determine the optimal method of taking a slap shot or a free throw. The Dallas Cowboys retained him to advise as to how the linemen can most effectively block and tackle. All of this costs money, of course, and while the Cowboys may be able to afford individual player analysis at $500 per, the average amateur athlete cannot. "I haven't charged any of the amateurs I've done work for." says Aricl. "but I have been able to do things for only a limited number. This will be changed with what we have planned with the USOC. "We arc setting up satellite centers at USOC training facilities in Squaw Valley and Colorado Springs. We'll hire some athletes and train them to use the computer terminals so that we can provide our biomechanical analysis to amateur athletes who come to these facilities." In another important way. Arid may influence the course of amateur sports in the U.S. lie and Dr. Irving Dardik, who has done much sports medicine work for the USOC. have formed a company which will be opening health centers. Among the facilities they will offer will be biomechanical testing that can be taken by children. "By analyzing the child's abilities at basic speed and strength skills involving the various parts of the body, we can help determine where his talents lie." said Anel. "A young boy may want to be a sprinter, but we may tell him that he will never be a great sprinter but he could be an Olympic caliber kayak racer." Ariel gives Al Feuerbach his "screen test." Generated on 4/20/2019 3:28:31 PM (PST) ADI/HQ/GBA/2019/ARIELCLOUD/v3.0.2018.0126.